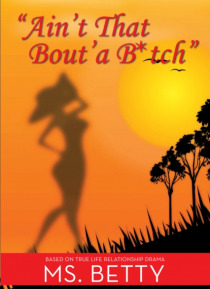 Ms. Betty's book, "e;Ain't That 'Bout'a B*tch"e;, is entertaining and genuine. It is a great reminder how much fun relationships can be, albeit sometimes at our own expense. Betty's own zany behavior, in the midst of train-wreck relationships, contributes to the chaos as she tries to find success in her love life. Each episode she endures is a real-life reminder to readers that our failed … relationships are merely practice until we truly understand love and life.Her descriptive, candid and raw style is a great element in the storytelling. It enables her to present the material such that the reader can visualize and share her experiences. And the individuals alongside Ms. Betty throughout the book are truly characters in their own right.If you enjoy down-to-earth humor, you will appreciate the vivid re-telling of life experiences designed to help others laugh and learn. Or if you can identify with the dating and love life struggles that simply make one shake their head and exclaim, "e;Ain't That 'Bout'a B*tch! "e;, then this book will entertain. Certain to provide laughter and life lessons. Well worth the read.